Sinatra never needed an introduction. In nightclubs and on concert stages, in saloons and on screen, Frank was always the center of attention. From New York to London and Las Vegas to Tokyo, he wowed the world over; a genuinely singular sensation, timeless and everlasting. Sinatra was and is an American – and international – treasure. The story of Frank Sinatra is that of someone born into humble beginnings who became one of the most famous and celebrated entertainers of his time. The astonishing thing is that if you got to know or observe him personally, you realized that Frank was an ordinary guy; similar to the rest of us, but blessed with an extraordinary talent. In the end, after all is written and said, the music is Sinatra’s legacy. Decades after it was first recorded, the body of music that he created remains nonpareil: a monument of artistry in a world of mediocrity. In the mercurial music business it takes only a millisecond for artists and careers to come and go. Five years is a lifetime; a decade signifies an eternity. How do you classify a musician whose first commercial recording was in 1939 and was still at it in 1993? Frank Sinatra defies classification. Throughout Frank’s life, no one even resembled him. There are no artists currently on the scene that are capable of duplicating his extraordinary career. Time only increases his importance and stature. Frank Sinatra’s music is still relevant because in it we discover how our lives evolved, as did his. The songs he sang were always approached on a very strong emotional level; he was more interested in the emotion of the song than its structure. Frank sang songs written by the greatest writers of his time: Cole Porter, Irving Berlin, Jerome Kern, Harold Arlen, Ted Koehler, Yip Harburg, Johnny Mercer, Sammy Cahn, Jule Styne, Johnny Burke, Jimmy Van Heusen, Oscar Hammerstein, George and Ira Gershwin, Lorenz Hart, Richard Rodgers, Hoagy Carmichael, Vernon Duke, Cy Coleman, Carolyn Leigh, Duke Ellington, and Antonio Carlos Jobim, among others. He is the most celebrated interpreter of the Great American Songbook. Hundreds of other singers sang the same songs, but they sounded different in Frank’s care. The bond he created with the public has never been broken. His music belongs to every generation who live and love. If you want to know what Frank Sinatra was all about, you need only listen to his music; then and only then can you understand the true essence of the man. As we celebrate the one-hundredth anniversary of his birth, the world needs the man and his music more than ever. She Shot Me Down is Frank Sinatra's last great album, a dark, brooding record of saloon songs delivered with an understated authority by Sinatra. Arranged and conducted by Gordon Jenkins and produced by Don Costa, the record largely consists of contemporary material, including five that were basically tailored for Sinatra. It's a dense, moody record that works spectacularly -- Sinatra's vocals are more alive and rich in detail than on Trilogy, and the concept is more concise and well-executed. She Shot Me Down might not consist of the classic saloon songs, but it has that feeling more than any of his other albums. Expanding on the concept of Songs for Young Lovers!, In the Wee Small Hours was a collection of ballads arranged by Nelson Riddle. 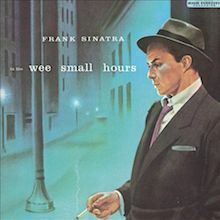 The first 12" album recorded by Sinatra, Wee Small Hours was more focused and concentrated than his two earlier concept records. It's a blue, melancholy album, built around a spare rhythm section featuring a rhythm guitar, celesta, and Bill Miller's piano, with gently aching strings added every once and a while. Within that melancholy mood is one of Sinatra's most jazz-oriented performances -- he restructures the melody and Miller's playing is bold throughout the record. Where Songs for Young Lovers! emphasized the romantic aspects of the songs, Sinatra sounds like a lonely, broken man on In the Wee Small Hours. Beginning with the newly written title song, the singer goes through a series of standards that are lonely and desolate. In many ways, the album is a personal reflection of the heartbreak of his doomed love affair with actress Ava Gardner, and the standards that he sings form their own story when collected together. Sinatra's voice had deepened and worn to the point where his delivery seems ravished and heartfelt, as if he were living the songs. 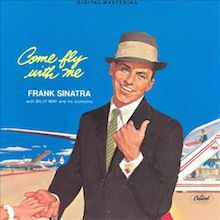 Constructed around a light-hearted travel theme, Come Fly With Me, Frank Sinatra's first project with arranger Billy May, was a breezy change of pace from the somber Where Are You. From the first swinging notes of Sammy Cahn and Jimmy Van Heusen's "Come Fly With Me" -- which is written at Sinatra's request -- it's clear that the music on the collection is intended to be fun. Over the course of the album, Sinatra and May travel around the world in song, performing standards like "Moonlight in Vermont" and "April in Paris," as well as humorous tunes like "Isle of Capri" and "On the Road to Mandalay." May's signature bold, brassy arrangements give these songs a playful, carefree, nearly sarcastic feel, but never is the approach less than affectionate. In fact, Come Fly With Me is filled with varying moods and textures, as it moves from boisterous swing numbers to romantic ballads, and hitting any number of emotions in between. There may be greater albums in Sinatra's catalog, but few are quite as fun as Come Fly With Me. 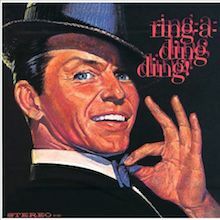 Ring-a-Ding Ding!, Frank Sinatra's first album for his own record label, broke somewhat from the strict concepts of his Capitol Records; in the process, it set a kind of template for the rest of his '60s Reprise albums. 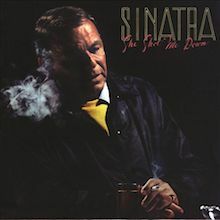 Instead of following a theme, the record captures the atmosphere of Sinatra in 1961 -- a time when he was running the Rat Pack, so it's no coincidence that the album is named after one of his favorite phrases of the era. The title track was written especially for Sinatra by Sammy Cahn and Jimmy Van Heusen. And that song reflects the brassy, swaggering feeling of the record -- even the ballads are arrogant and self-confident. 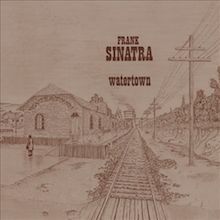 Watertown is Frank Sinatra's most ambitious concept album, as well as his most difficult record. Not only does it tell a full-fledged story, it is his most explicit attempt at rock-oriented pop. Since the main composer of Watertown is Bob Gaudio, the author of the Four Seasons' hits "Can't Take My Eyes Off of You," "Walk Like a Man," and "Big Girls Don't Cry," that doesn't come as a surprise. With Jake Holmes, Gaudio created a song cycle concerning a middle-aged, small-town man whose wife left him with the kids. Constructed as a series of brief lyrical snapshots that read like letters or soliloquies, the culminating effect of the songs is an atmosphere of loneliness, but it is a loneliness without much hope or romance -- it is the sound of a broken man. Producer Charles Calello arranged musical backdrops that conveyed the despair of the lyrics. Weaving together prominent electric guitars, keyboards, drum kits, and light strings, Calello uses pop/rock instrumentation and production techniques, but that doesn't prevent Sinatra from warming to the material. In fact, he turns in a wonderful performance, drawing out every emotion from the lyrics, giving the album's character depth. By 1967, bossa nova had become quite popular within jazz and traditional pop audiences, yet Frank Sinatra hadn't attempted any Brazil-influenced material. Sinatra decided to record a full-fledged bossa nova album with the genre's leading composer, Antonio Carlos Jobim. Arranged by Claus Ogerman and featuring Jobim on guitar and backing vocals, Francis Albert Sinatra & Antonio Carlos Jobim concentrated on Jobim's originals, adding three American classics -- "Baubles, Bangles and Beads," "Change Partners," and "I Concentrate on You" -- that were rearranged to suit bossa nova conventions. The result was a subdued, quiet album that used the Latin rhythms as a foundation, not as a focal point. Supported by a relaxed, sympathetic arrangement of muted brass, simmering percussion, soft strings, and Jobim's lilting guitar, Sinatra turns in an especially noteworthy performance; he has never sounded so subtle, underplaying every line he delivers and showcasing vocal techniques that he never had displayed before. 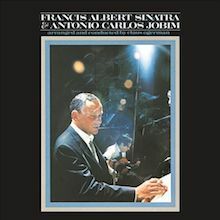 Francis Albert Sinatra & Antonio Carlos Jobim doesn't reveal its pleasures immediately; the album is too textured and understated to be fully appreciated within one listen. After a few plays, the album begins to slowly work its way underneath a listener's skin, and it emerges as one of his most rewarding albums of the '60s. Following the across-the-boards success of Strangers in the Night, That's Life continued Frank Sinatra's streak of commercially successful albums that straddled the line between traditional and contemporary pop music. Adding more pop music techniques to his repertoire of show tunes, That's Life made contemporary pop concessions while satisfying Sinatra's own taste for weightier, more respected material. Although it was a pop-oriented record, Sinatra had not begun to rely on rock-influenced productions; instead, arranger/conductor Ernie Freeman contributed charts that alternated between bluesy, brassy swingers and mildly schmaltzy string arrangements, supported by an overbearing backing chorus. While the title track was the hardest blues Sinatra ever tried, that approach wasn't attempted for the entire album. A few tracks -- particularly a rearrangement of the New Vaudeville Band's campy "Winchester Cathedral" and the static version of "The Impossible Dream" -- fall flat, but the album works when Sinatra is either tearing into the song (like "That's Life") or coaxing life out of mid-level ballads like "You're Gonna Hear From Me." 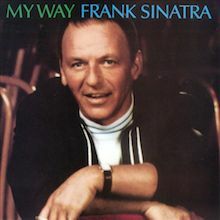 Although it follows the same patterns and approach as Cycles, My Way is a stronger album, with a better, more varied selection of material and a more focused, gutsy performance from Frank Sinatra. Built around the hit single "My Way," the album again alternates between rock covers ("Yesterday," "Hallelujah, I Love Her So," "For Once in My Life," "Didn't We," "Mrs. Robinson"), a couple of adapted French songs, and a handful of standards. This time out, Don Costa has written more engaging charts than the previous Cycles. The Beatles' "Yesterday" is given an affecting, melancholy treatment that brings out the best in Sinatra, as does the new arrangement of "All My Tomorrows," which is lush and aching. 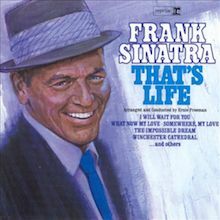 If Sinatra doesn't quite pull off the R&B of "Hallelujah, I Love Her So," he does sing the light Latin stylings of "A Day in the Life of a Fool" beautifully, and he has fun with Paul Simon's "Mrs. Robinson," changing the lyrics dramatically so they become a tongue-in-cheek, swinging hipster tribute. For that matter, most of the record is successful in creating a middle ground between the traditional pop Sinatra loves and the contemporary pop/rock that dominated the charts in the late '60s. My Way doesn't have the macho swagger of his prime Rat Pack records, but its reflective, knowing arrangements show that Sinatra could come to terms with rock & roll at some level. 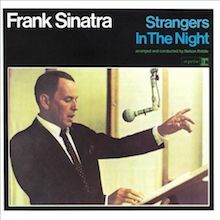 Strangers in the Night marked Frank Sinatra's return to the top of the pop charts in the mid-'60s, and it consolidated the comeback he started in 1965. Although he later claimed he disliked the title track, the album was an inventive, rich effort from Sinatra, one that established him as a still-viable star to a wide, mainstream audience without losing the core of his sound. Combining pop hits ("Downtown," "On a Clear Day [You Can See Forever]," "Call Me") with show tunes and standards, the album creates a delicate but comfortable balance between big band and pop instrumentation. Using strings, horns, and an organ, Nelson Riddle constructed an easy, deceptively swinging sound that appealed to both Sinatra's dedicated fans and pop radio. And Sinatra's singing is relaxed, confident, and surprisingly jazzy, as he plays with the melody of "The Most Beautiful Girl in the World" and delivers a knockout punch with the assured, breathtaking "Summer Wind." Although he would not record another album with Riddle again, Sinatra would expand the approach of Strangers in the Night for the rest of the decade. After the ballad-heavy In the Wee Small Hours, Frank Sinatra and Nelson Riddle returned to up-tempo, swing material with Songs for Swingin' Lovers!, arguably the vocalist's greatest swing set. 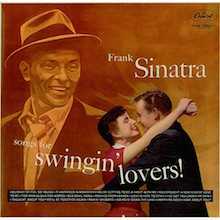 Like Sinatra's previous Capitol albums, Songs for Swingin' Lovers! consists of reinterpreted pop standards, ranging from the ten-year-old "You Make Me Feel So Young" to the 20-year-old "Pennies From Heaven" and "I've Got You Under My Skin." Sinatra is supremely confident throughout the album, singing with authority and joy. That joy is replicated in Riddle's arrangements, which manage to rethink these standards in fresh yet reverent ways. Working with a core rhythm section and a full string orchestra, Riddle writes scores that are surprisingly subtle. "I've Got You Under My Skin," with its breathtaking middle section, is a perfect example of how Sinatra works with the band. Both swing hard, stretching out the rhythms and melodies but never losing sight of the original song. Songs for Swingin' Lovers! never loses momentum. The great songs keep coming and the performances are all stellar, resulting in one of Sinatra's true classics.